Our middle child just started his first year of preschool and he is very excited to be going to school like older brother. 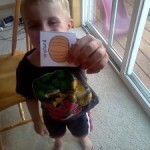 This year he will learn a lot about letters and printing. This week they were learning the letter A. I decided to suppliment his school lessons with some lessons of my own at home. 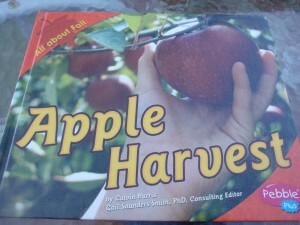 Apple Harvest by Calvin Harris and Gail Saunder-Smith, PhD is an excellent book to start out the lesson. 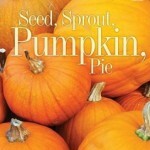 This book has bright pictures and large simple print. 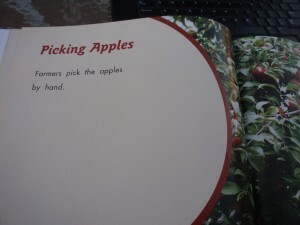 To drive home the point of harvesting apples by hand, you can sing songs like My Apple Tree on Everything Preschool. While singing the song have the children do actions to represent reaching into a tree, picking an apple and dropping it into a basket. The day before the boys and I picked apples from the apple tree at the farm. Jonnie and I put together an apple crisp using those apples when we started the lesson. 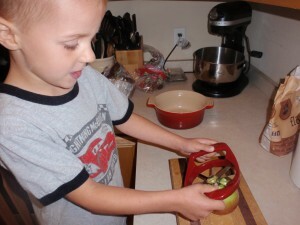 Jonnie was able to use my apple slicer to cut the apples. We then counted the slices and talked about fractions while measuring the ingredients. We used the Betty Crocker Apple Crisp recipe. I swapped in whole wheat flour. 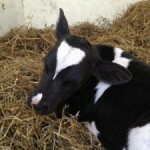 Read Sweetland Orchard’s blog. This orchard is located near our farm and they do a great job talking about the variety of apples they have and how the trees are doing. 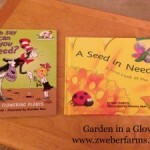 All the worksheets I link to are free. 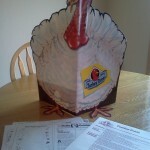 Make sure to follow my Farm Learning Activities board on Printerest to see more apple activities and fun farm learning. Do you do an apple unit at your school? Tell me what activities you like to do.